Burl Burlingame is still posting pictures of fantastic sunsets over Pearl Harbor and tagging me with them, making me wish I could still be there — as if I needed such prompting. There’s nothing like a Pacific sunset. Anyway, this morning I was looking for something unrelated among my pictures from my recent trip, and ran across this one that I had failed to share when I wrote about visiting Burl’s aviation museum on Ford Island. It was a touch of home, one rivaling those sunsets in pulchritude. On a display next to a C-47 — something that fills me with nostalgia, since it’s the first aircraft I ever flew on (in South America, over the Andes, when I was about 9 or 10) — there it was: The most popular pinup of South Carolina model Jewel Flowers Evans, whose face and figure was made famous by artist Rolf Armstrong. 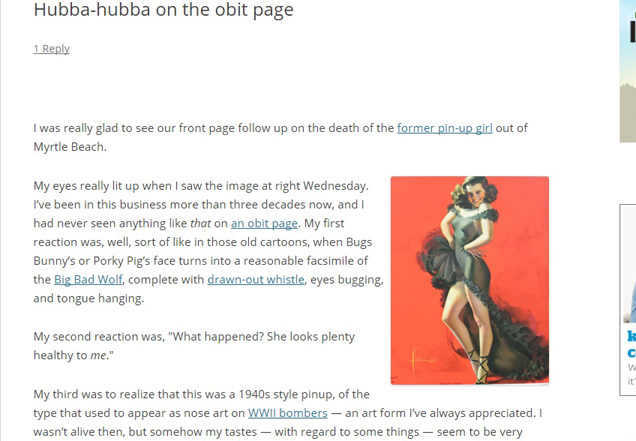 Her obituary in The State in 2006 called her “probably the number one pin-up girl of all time.” Whether she was or not, she gets my vote. Here are some other images of her, including this photo that is apparently from the same session in 1941 that produced the one on the nose of that plane. Anyway, that very same image ran on The State‘s obit page when she died, something that startled me sufficiently that I wrote about it on my then-young blog. This entry was posted in Art, Blogosphere, History, Military, Nostalgia, South Carolina, Women on April 16, 2015 by Brad Warthen. Hey, in one of these pictures she’s with Duke Kahanamoku! 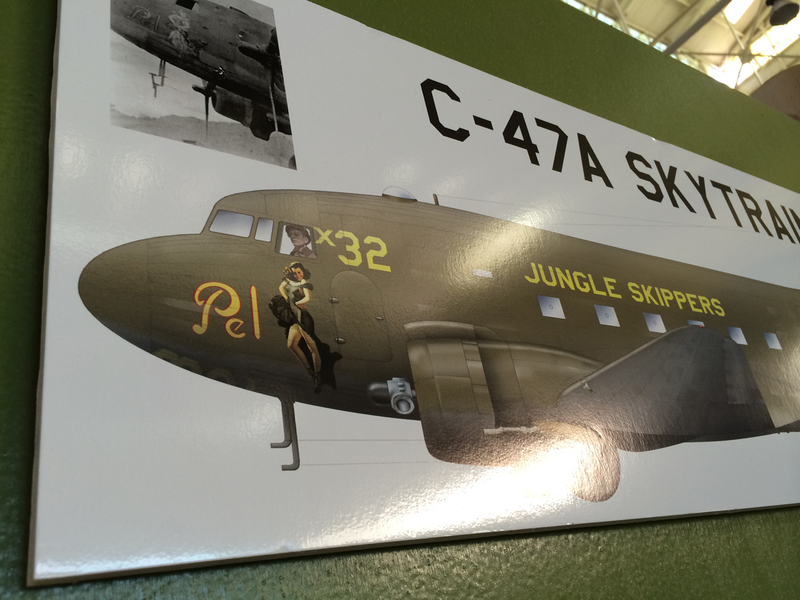 When drawing the artwork of the C-47, I couldn’t quite make out the pinup art on the nose in the rather fuzzy photograph. So I posted the photo on a model airplane chat group and crowd-sourced. I got the answer back in minutes, maybe seconds, from my fellow model nerds.